Bedford is, perhaps unsurprisingly, the county town of Bedfordshire. The name comes from a Saxon Chief called Beda combined with the ford that crossed the River Great Ouse. Over the years, the town's main industries were wool, lace and then brewing. The town of Bedford has a population of around 80,000. However the wider area, the Borough of Bedford, is home to a total of around 166,000 people. As the town expanded northwards during the 19th century, a park was designed and constructed. It is called Bedford Park and is the largest urban park with the town. The land that forms the park along with much of the surrounded residential areas, once belonged to the Hospital of St John the Baptist having been donated to the church by Robert de Parys. Towards the end of the 19th century, the local council promoted a bill in Parliament which sought to remove the church's control of the land. In 1881 the council eventually took over responsibility for the land. Initially the council had trouble finding the necessary funds to finance the creation of the park, but were incentivised following Queen Victoria's Golden Jubilee and the park was finally opened on 11 July 1888. The formal opening was conducted by The Marquess of Tavistock who used a golden key to ceremoniously unlock the main gates. There is a commemorative plaque on the gates noting the occasion. Inside this typical Victorian park you will find a meandering perimeter path, an ornamental lake with fountain, formal planting including many mature trees and herbaceous borders, a bandstand, and the pavilion building. Sports facilities include tennis courts, a bowling green, marked pitches for football, cricket, rounders and basketball. There are two children's playgrounds and also an indoor swimming pool, the Robinson Pool. 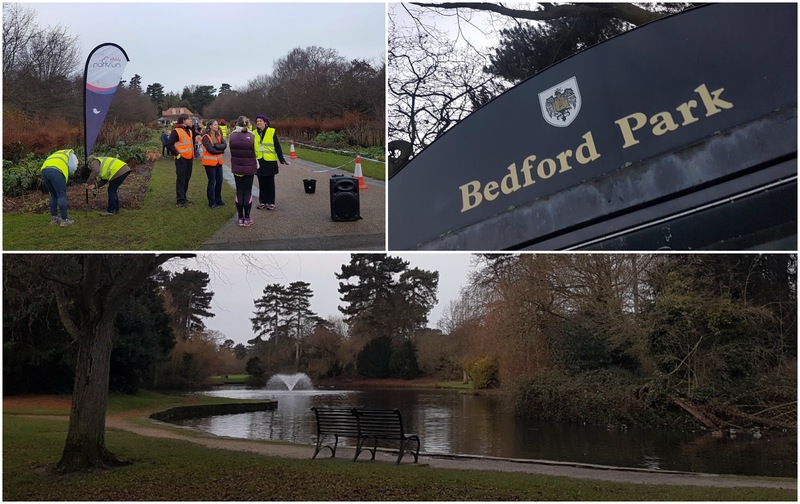 On 11 June 2011 the park became home to Bedford parkrun. Over the years the event has grown from just under 100 attendees per week to its current average of around 400. The attendees meet just before 9am every Saturday at the original glorious Victorian bandstand, which was refurbished in 1995 after fire and vandalism almost lead to its demolition. It is located at the central point of the southern border of the park, adjacent to Park Avenue which incidentally has free on-street parking. I drove to the venue on New Years Day 2018 as the first of my NYD double with Rushmere parkrun (blog here). I parked on Park Avenue, but there is also a free car park on the west side of the park just off of Foster Hill Road. I hear that there used to be iron railings running along the border with Park Avenue, but these were removed in the 1970s which means you can easily nip through the trees and into the park. For cyclists I spotted quite a few bike racks dotted around the park, so you'll have no trouble on that front. Travelling by train would mean alighting at Bedford mainline train station. This is located just over a mile south-west of the park, so is a decent distance for a brisk warm-up walk or jog to the venue. Once in the park, I checked out the on-site park information map - it indicates one set of toilets just next to the lake in the south east corner. The toilet is one of those pay-to-enter blocks with the automatic door, so you would need some loose change for this. The Bedford parkrun course page indicates two other sets of toilets, one at the Pavilion and another next to the car park. 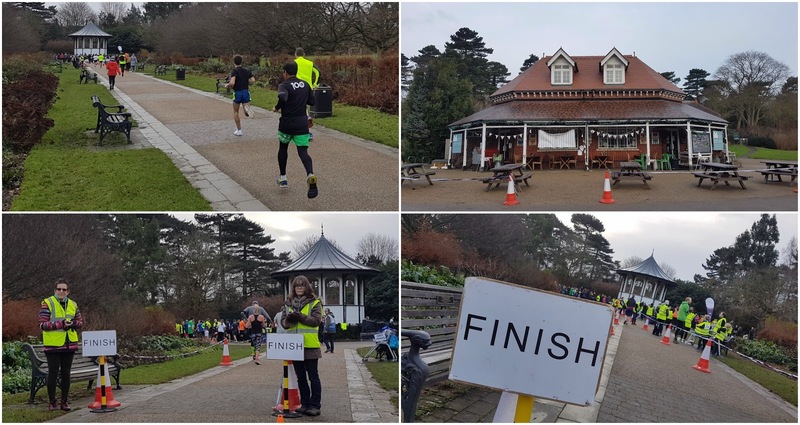 The first-timers and main briefings take place at the bandstand and the participants then wander down to the start line which is next to the lake at the eastern end of the park. The 5k course takes place over two-and-a-half clockwise laps of the main perimeter path with a finishing straight right through the lush north-south central avenue which breaks off of the main loop added on at the end. Underfoot is 100% tarmac and the paths are well maintained - it is ideal for buggy runners and wheelchair athletes. The profile of the course is almost completely flat, but if you are running at your maximum effort you may find you notice an ever-so-gentle rise in elevation around the north west corner of the park. In reality, this is a flat and fast course. As I ran here at 9am on New Year's Day, the attendance figures were understandably lower than the Saturday average. In the end, 239 people ran, jogged and walked their way around the course at event #339. The regular post-run coffee social takes place in The Pavilion. 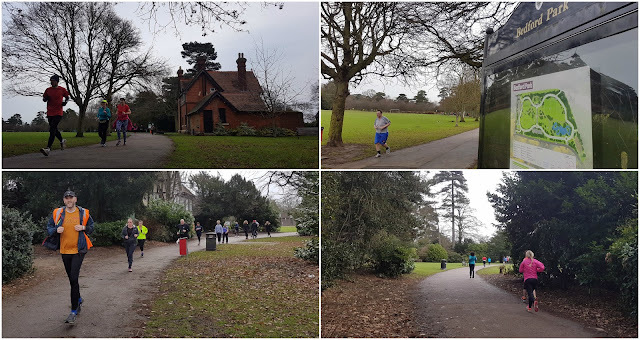 I ,of course, had a second parkrun to get to so after a short cool-down jog and taking some photos, headed off in the direction of Rushmere parkrun. 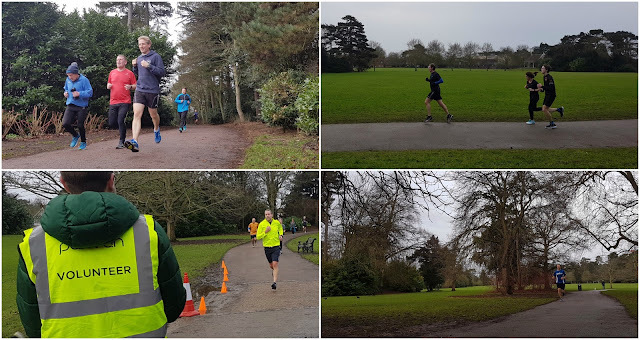 I had, as always, recorded my run using my Garmin and you can see the course data on Strava, here: Bedford parkrun #339 GPS Data. I also used that data to create a fly-by video using the Relive app on my phone, and you can view that video on youtube, here: Bedford parkrun Relive Course Fly-by. It's a great course for trying for a fast time and the park itself is pleasant and scenic. Finally, a big thanks to the volunteers that made it all possible.